The uncompromising reticence to discuss the matter of Garda corruption is incredibly sinister. A recent RTÉ fly-on-the-wall documentary, The Guards, was advertised with an emotive montage of individual Gardaí speaking to camera, intimately relating various bad experiences they’d endured during duty: “I’ve been called names”, “I’ve been headbutted”, “I’ve been kicked”, and so on. I can identify with their trauma. Living in the inner-city, I’ve been verbally abused, threatened, punched, kicked, had my home smashed up, and had money and personal belongings stolen from me. But I didn’t feel safe calling the police. Why? Because all these actions were carried out by members of An Garda Síochána on operational duty. And it all happened before I was eighteen. I was six years old the first time I was strip-searched. Our national broadcaster chose to air this documentary at the height of a policing crisis. The programme provided a lengthy forum for Gardaí to boast unchallenged of the prowess their new initiatives. “New” intiatives which include a continuation and escalation of their futile war on drugs. As Noam Chomsky has pointed out, it is not actually a war on drugs, or on people who take drugs, it is instead a war only against poor people who take drugs. If ever a policy was designed to inflict misery on the weak and vulnerable it is this idiotic and evil folly. It would have more useful, if instead of this programme, sympathetic to our newly discredited police force to the point of sycophancy, we had a documentary about the assaults Gardaí perpetrate on working-class young people and vulnerable addicts. Or perhaps an investigation into some of the suspicious deaths of those under arrest. Deaths like that of 20-year-old Terence Wheelock, a young man with no history of self-harm who police assert hung himself in custody. Or Brian Rossiter who was only 14 years of age when he died from brain injuries in a police cell. His parents were told by Gardaí that disciplinary proceedings arising from incident were “none of their business”. As Fr Peter McVerry put it, speaking of how young people in the inner-city relate to the police, “neither group has any respect for each other, but it is up to the Gardaí to show some respect for the people they have power over”. 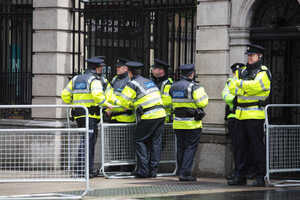 It is the Gardaí, remember, who, acting freely as adults, swear an oath, don a uniform, and are paid money to uphold the law. In my experience, this means nothing to them. 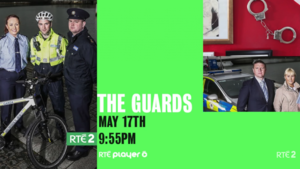 RTÉ’s The Guards continues a long tradition throughout Ireland’s media of unquestioningly accepting any narrative offered by Gardaí, and relating stories from only their perspective. Our media is beholden to An Garda Síochana, not least because members of the force continue to feed journalists stories at their individual discretion, without anything approaching due process. The most obvious exemplar of this is the country’s highest profile (and highest-paid) crime correspondent, Paul Williams. In perhaps the most egregious example of the power Williams wields, he went on the Late Late Show one week before the election, and explicitly warned viewers not to vote for Sinn Féin – because a vote for them would endanger lives. He contended his antipathy for this political party was due to their intention, if elected, to abolish the Special Criminal Court. This is a proposal backed by both the Irish Council for Civil Liberties and Amnesty International. The Special Criminal Court was established in 1972, purely to deal with the escalation of IRA violence at the time. The court was always intended as a temporary measure, to be abolished when the Troubles ended. There is no jury. 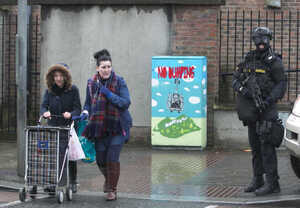 According to Williams it’s only the gangsters and drug-dealers “smirking on Francis St” (did he see this?) that want this extraordinarily draconian “Star-Chamber” style court abolished. Yet ironically, the court has used its full set of powers to prosecute anti-drug activists in the past (with convicted heroin dealers appearing as witnesses for the State). Williams, who also receives 24-hour protection from the police (paid for by the taxpayer), has little or nothing to say on the subject of Garda corruption other than to deny its existence. Throughout his career, he has backed up An Garda Síochána to the hilt. 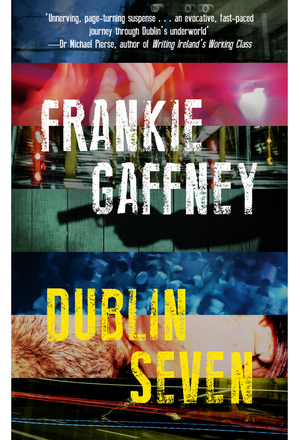 The fanciful depiction of the Gardaí as the perpetual good-guys continues into fiction. Also from RTÉ, the phenomenally succesful Love/Hate fed audiences hungry for an insight into Dublin’s underworld. I admit to a love/hate relationship with this drama. The writing, the directing, the acting, the storytelling as a whole – at times all were fantastic. The show displayed serious Irish talent, and made incredibly compelling viewing. It deserved its success. Like most Dubs, I was excited all week for the next episode. But the “Guards = good”, “gangsters = bad” narrative is just not real life. Not even close. The recent epidemic of corruption in an Garda Siochana was just the tip of the iceberg. Prior cases in Donegal and ongoing revelations from Leitrim demonstrate this clearly. Yet any concessions from the establishment that there may be the remotest hint of corruption within the force have to be bitterly fought for. The reticence to even discuss the subject, the bitter resentment and persecution displayed towards those who raise it, and the silence on the potential for deeper problems, is incredibly sinister. For example, anyone with the remotest concern for policing standards should have been screaming from the rooftops the moment the now faithfully departed Commissioner Callinan denied (prior to any inquiry) that there was corruption in an Garda Siochana. All organisations the size of An Garda Siochana (approaching 13,000 members) will, as a matter of course, have some corruption. Callinan was claiming nothing short of omnipotence. This disgraceful – despicable – assertion from that blustering buffoon should have seen him sacked on the spot. Yet it went largely under the radar. This thundering disgrace masquerading as a public servant went on to refer to the courageous whistleblowers, who stood up to bullying and smear tactics in pursuit of the truth, as “disgusting”. The whole squalid episode was shameful, exposing for all to see the rotten core of this state. Yet now, after some cosmetic changes, some optics, a few soundbites and some window dressing, the situation has been remedied in the goverment’s eyes. You may proceed. Last month Jim McGowan was promoted to the position of chief superintendent, an appointment which came – coincidentally – just two weeks before responsibility for promotions was to be handed over to an independent authority. Jim McGowan also happens to have been the officer in charge of a a Garda unit specifically established to prosecute (or persecute?) political activists. The same unit that designated 20 Gardaí in Tallaght to evidence gathering duty over a single protest in Jobstown – a protest at which nobody was even injured. The same unit that sent 10 Gardaí in three cars to bang on a family’s front-door at 7am, to arrest a 16-year-old water protestor before he went to school. 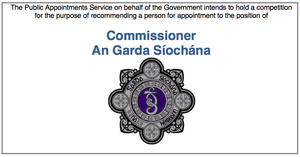 This, apparently, is what makes you rise in the ranks of An Garda Síochána. Jim McGowan also happens to be Noirin O’Sullivan’s husband. The commissioner’s attention certainly doesn’t seem to be focused on ending nepotism, or the unhealthy influence of party political interests on policing. Or, for that matter, on tackling corruption. Nobody seems to be asking what part such frivolous and petty diversions of resources (or indeed potential high-level corruption) might play in allowing the gangs to operate as smoothly and effectively as they do. The financial crisis that was used as an excuse for a massive transfer of wealth from the poor to the rich (and gargantuan cuts in health spending) was, in this country, brought about by recklessness, poor regulation and criminality in the banking and financial sectors. To prevent this happening again, the Office of the Director of Corporate Enforcement (ODCE) was established. It was recommended that a dedicated team of forensic accountants be set up to target “white-collar crime”. One accountant was assigned to this task. I say “was”, because this accountant has subsequently been transferred to other duties. For the past six months no accountants have been employed in this task. While the media have been focused on gossip and speculation about the personalities involved in a petty “gangland” feud, in Ireland today a white-collar is carte blanche to commit crime. The type of crime that crippled this economy, consigned thousands to emigration, and has led this country to a situation where 10 people every week commit suicide. And Paul Williams proclaims it is a vote for a party that wants to end this status quo that would endanger lives? I see muscle bound men driving SUV’s with tinted windows, wearing balaclavas, carrying automatic weapons. These are the Gardaí. If the children of the north inner-city Dublin are scared, what are they seeing that is scaring them? “We need to demilitarise our police departments so they don’t look and act like invading armies,” said US presidential hopeful Bernie Sanders. Creator of The Wire, David Simon, said Baltimore police treated people the same way “an Israeli patrol would treat Gaza, or the Afrikaners would have treated Soweto back in the day . . . they’re an army of occupation”. Any of these comments could be applied to inner-city Dublin today. Unlike our newspapers, unlike our documentaries, unlike our dramas, Simon’s magesterial American TV series The Wire did show the back-story behind their characters. It showed the reasons people fall into cycles of crime and addiction, what it is that causes poor and vulnerable people to to enter an inescapable spiral of criminality – a cycle that damages themselves as much as anyone else. It showed how social conditions, inequality and deprivation, compel people to criminality. It also showed that corruption and profiteering from drugs and “gangland” extends right the way throughout our society, throughout our institutions, throughout the police force. All the way to the top of the political ladder. Our writers, our journalists, our newspapers, our broadcasters, need to take note – and start telling the full story too. Anything less is a lie. Posted in Misc and tagged An Garda Síochána, Frankie Gaffney at 3:31 pm on June 27, 2016 by Admin. frankie needs to edit that piece. some mistakes in there. i taped the guards but didnt watch it. the ad turned me off it. oh the news on the jungle wire is that Paul Williams will be doing the breakfast show on newstalk. The Wire was, and still is, the greatest TV ever. As someone who’s never really questioned [thankfully I never had to] the guards, this really intrigues me. High profile cases of police misconduct around the world – there’s no reason to ever think ours should be exempt. Very interesting perspective here and well written. The piece has only been up a couple of hours and already there seems to be a concerted campaign attacking me rather than what it says in the article. I’m no angel, and I’ve never claimed to be. My life is an open book (as it were). But for the record, not once did I so much as touch let alone take an illegal drug until my early twenties (well after the incidents w the Gardaí I referred to happened). In fact, I had been mildly involved in the community anti-heroin movement as a kid. Irrespective of all that, whether they are dealing with cheeky kids (like I was then), drug addicts or targetting major criminals, the Gardaí have an obligation to obey the law. To do otherwise makes a mockery of the entire judicial process. It might be an idea, if commenting further, to deal with the substance of my argument, rather than launch ad hominem attacks on me personally. That’s a bit of an “I’m alright, Jack” attitude. Look at the suffering that good, decent men like Maurice McCabe went through because they were sickened by the corruption they saw all around them in the force. His name was blackened by the higher ups in order to protect their cozy positions and maintain the ‘keep the head down’ and circle the wagons attitude endemic in the gardaí. The garda commissioner himself called him disgusting. Tell Maurice McCabe that things were worse in 1930s Chicago. Tell it to his family. Tell it to the thousands of decent guards who are equally sickened, but too afraid to speak out at the sloppyness, the corruption, the drinking culture, the bullying and, behind it all the under resourcing and unprofessionalism that pervades the gaurds because they too know that they will be sidelined and excluded for doing the right thing. We are not well served. Unless ‘we’ means middle class professionals in nice areas. And even then you’re not because your police force will go after you just as quick if you cross them. Good article Frankie, fair play, I’ll be checking out your book. Frankie makes some excellent points, in any organisation of 13,000 members just by sheer numbers alone there is going to be corruption. The question is how high does it go? We have already firm evidence in the Kieran Boylan case of members of the Gardai being involded in heroin trafficking. Which makes one wonder how it is that the Kinahan Cartel is having such a free run in Ireland. Kinahan’s are now worth in the region of €800 million, what would be €5m to pay a few senior Gardai for information and assistance? 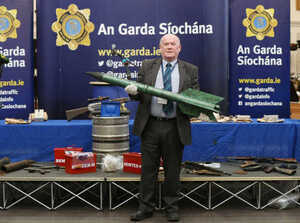 Lets not forget either that Kinahans have been operating since 1986, its their 30th anniversary in the drugs business this year and now they’re bigger than ever and the Gardai have stood back and watched this happen. Sharp piece of writing Frankie. Its beyond belief that Noreen O’ Sullivan had to be reminded recently that six-year old Mary Boyles body is still, 40 years on, in the bog in Donegal. Garda corruption in Donegal is not a thing of the past.. Ask the McBrearty family in Donegal about their experiences with the Gardai. I need say no more. brian rossiters parents asked the gardai to keep their son in custody. Are you blaming his parents for his death? that said it is well known in the north inner city who killed wheelock. Bit of pro-SF propaganda shoe-horned in there amongst the good points. Ireland is gone to the dogs , no doubt about it. The fact the killers of murdered garda on duty have nevér been caught is an eye opener. ( and a bloody disgrace ). The corrupt garda are not weeded out at all…..therein lies the problem. Passion, insight, clear elegant prose – have we been hacked? Talk about TLDR – I got a cramp in my finger just trying to scroll past it!! You got a cramp not reading it then. Your opinion is void. I have read the reports into Wheelocks death. Independently examined by GSOC Coroners etc.and the Gardai were cleared. No investigation in Ireland is Independent. Should I be ashamed of being a middle class professional? I have no personal experience of misbehaviour by the Gardai, but I do wonder how the Hutch and Kinahan gangs can apparently kill each other at will, while the supposed forces of law and order just stand idly by and do absolutely nothing to bring the killing to an end!